We, have all heard a great deal about Gheluvelt. We have been told a lot of bare facts—we have seen accurate accounts and even historical accounts of the battle fought in and around that vital spot on the 31st October, 1914. We are not likely to forget it, and in commemoration of that great day we go through the ceremony of Trooping the Colour annually. Let us picture, if possible, the 31st October, 1914. Imagine now (it was not imagination then) this same old 2nd Battalion (or father what was left of it) just immediately before the order to counter-attack was received. The Battalion at that moment had a fighting strength of 1 Major, 5 Captains, including the Adjutant, and 5 subalterns, with about 400 other ranks. All these men were war-worn and physically exhausted from strain, exposure, and loss of sleep. The fighting had been continual against what we knew to be the flower of the great German Army, an army superior in artillery, flushed with victory, with the Kaiser at, their head (or to be more accurate behind them!) an army determined to crush once and for all the contemptible little British Force and force a way to the nearest channel ports. Many of us realised the situation, and knew that these same worn-out and sorely tried men must hang on at all costs and save the breaking of the line. We knew that the troops on our flanks were in the same condition, and were suffering in the same way—we began to realize also that as far as reserves or reliefs were concerned we had drawn a blank—there were none—we were all out. 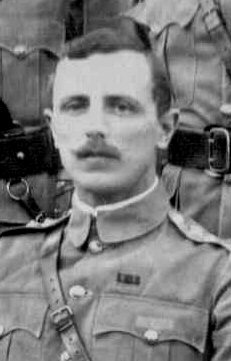 At the moment we were supposed to be having a few hours' "rest," in close support to the 2nd Division, the front line of which was a few hundred yards to our front. Every single soul dog tired, cold, wet, and plastered with mud, had been unwashed and unshaved for days on end. Our hair had grown to an incredible length, and beards were of such varied types and sizes that it was only with difficulty that some of us could be recognised. 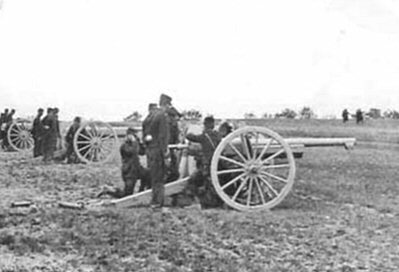 Deficient of various articles of clothing and equipment, many in little more than rags, mufflers, some with putties, some without, packs discarded in the wood, we still had our best and most reliable friends—i.e, our rifles and bayonets— with plenty of ammunition, and we knew, thank God, how to use them. There we were—a pretty picture indeed—dug in along the edge of a wood, wondering what next, so to speak. The roar of artillery and the crashing of the Bosche shells were tremendous, whilst the constant rattle of machine guns and bursts of rifle fire told us plain enough that there was something doing on a big scale. Most of us knew not exactly what was happening, but there were some who did, and said little or nothing. It was best so. We got our orders, no need here to mention names or how they were received, but we got them, and we wondered if there was any hope of success. We had no doubts as to the morale of what was left of the Battalion, for we knew the men would face anything with that same wonderful spirit that had been shown from the very beginning. Yes—we wondered—the Commanding Officer and certain others (very few in numbers who are alive to-day) who knew the situation— would it be possible for such a handful of exhausted troops to go forward, pass through the remnants of the shattered 1st Division, and restore the line by retaking Gheluvelt and the commanding ground in the vicinity? How many could possibly survive and remain there long enough to be of any real value? What did it all mean? Where were the French? When were they coming to help us and perhaps even relieve us? Surely they must come soon or they would be too late? Their 75's (French Field Guns) were barking away defiantly from the woods behind us. It was a treat to hear them, but at the same time where were the infantry? Those blue-coated, red-trousered "poilus" — it would have been encouraging to have had even a glimpse of them these critical days. 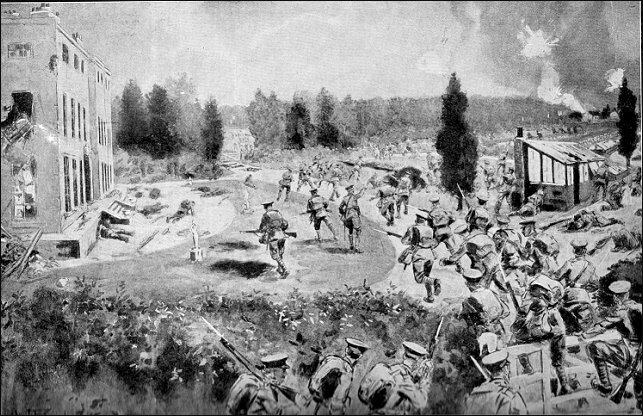 The bombardment grew in intensity, rifle fire increased, more bullets came threateningly over us with their beastly whine and smack, wounded men were coming back in ever-increasing numbers from the 1st Division line near Gheluvelt. The order to counter attack came sure enough. The British line was broken, pounded to blazes. The sorely tried and battered remnants of the 1st Division were driven in. Hardly an officer or a man unwounded. We rose, went forward by Companies in fours, deployed, and then advanced in two lines—the last remnants of the 1st Division passed actually through our ranks to the rear, and such remarks as "You can't go on, it's murder," were hurled at us. But we went on right enough, there was no turning back, in spite of the heart-breaking spectacle of those battered men passing through us. Crossing one particular open space the enemy's artillery spotted us, and we found ourselves enfiladed or nearly so from our left front. The Germans seized the opportunity, and pounded us with shrapnel and high explosive, with the result that over a hundred men were left dead or wounded on that open space alone. We reached a wire fence. We cut through it as best we could. At length the Chateau grounds, and there was the Hun right enough, but we had surprised him. He hadn't seen us coming (though indeed his artillery in support certainly had). There was a cheer, and we charged as best we could over the ground. The Hun seemed lost. He commenced to retire, but his fight at such close quarters was feeble. Few were bayoneted, most of them being shot at point blank range, but we hastened his retirement, cleared the Chateau grounds, and pushed on to a sunken road with our right on Gheluvelt Church. That was far enough. So far our task was done. We dug in as best we could, and prepared to hold on should the Hun attack again. On our left we had some South Wales Borderers, who had held on, and prior to our arrival were almost surrounded. On our right there appeared to be no one—except small parties of lost Germans Working their way back again. 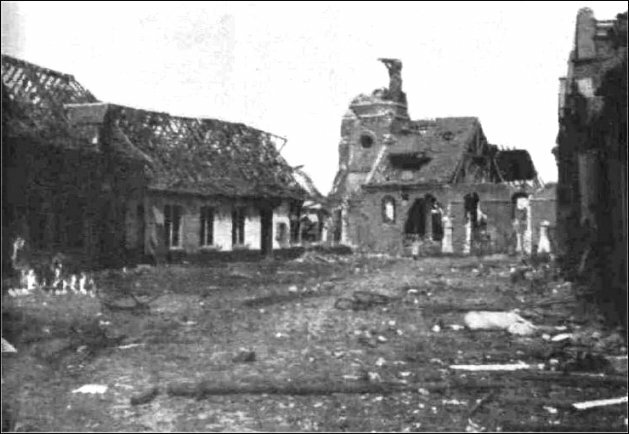 Both the Germans and ourselves were in the village and both artilleries were busy shelling it. Some of the houses went aloft at very frequent intervals, many others were burning merrily. When darkness came the firework display was worth seeing. It was weird and uncanny. How well I remember standing with the Company Commander of the right Company amongst the tombstones round the Church, watching for the Hun at the cross roads, and gazing at the burning houses, wondering as usual, "What next ! " Life after all was nothing but one damned thing after another. Sniping and shelling continued, but no attack developed. Every one was dead tired, and even hungry by this time. The Chateau behind us was burning. Our wounded had to be got away, though some fell into the hands of the enemy. At about ten o'clock that night we got orders to withdraw, and we did so Company by Company in the most orderly and unconcerned way imaginable. Back we went to the new line, which by that time had been dug behind us, and which was held once more by the remnants of the same old 1st Division. It was an anxious moment approaching their line under cover of darkness from the enemy's side. They had a natural distrust for everyone, so often had mistakes happened through Germans disguised in British uniform. It was a near thing to disaster for the Battalion that night at the hands of the Black Watch, who held that part of the line, and were running no risks. Those of us who were leading heard the challenge, the quiet words of command, the opening and closing of bolts. We answered the challenge and one only was allowed to approach, the remainder kneeling or lying down in suspense. The one who went forward was questioned and cross-questioned, for the Black Watch were cautious, and small blame to them. Having satisfied them, the signal was given to lead on. We led on, fully realizing that many rifles were trained on us, and that one shot in accident might cause the whole line to open Tire. But, all was well, and I think this speaks well for the discipline of the Highlanders. We filed through their line and felt comparatively safe once more. The success of our counter attack was already well known, and the Battalion was already famous for it. Many and hearty were the congratulations hurled at us that night. But our labours were not ended, for more trenches had to be dug then and there. So we dug and dug for life. Oh no, there was no rest or sleep possible. We just carried on, and those who live will never forget the strain. We all know what fear is, but when that time comes, for God's sake hide it and be of good cheer—things are never so bad that they cannot be worse. That is the end of the story, told as far as possible from the human side. It was "Esprit de Corps" that enabled those men to stand that strain and carry on: "Esprit de' Corps" coupled with British courage, and that remarkably good feeling and comradeship which existed then and exists now between those who lead and those who follow.